Joseph Severn was a very good artist I think and I think overall his portraits of John Keats were the most accurate. jesleeall wrote: Question: I read somewhere - I think it was in Andrew Motions biography - that Severn made two deathbed portraits of John. One, of course, would be the one we're all so familiar with, but I've never seen the other one. Do any of you know anything about it? "Sitting up in the middle of the night around this time, desperately trying to keep awake, Severn hit on the idea of sketching his friend. (This is the one we're all familiar with: my note). 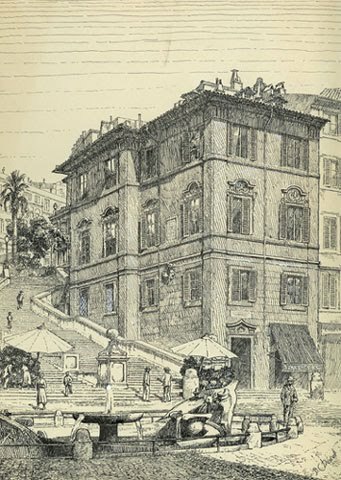 It was the second drawing of Keats he had attempted in Rome. The first, which has never previously been reproduced, was done after Keats took to his bed. Even so, it shows a powerful figure and though the eyes are large and pleading, the mouth is still full. One hand lies open in a characteristic Baroque gesture of supplication. As Severn worked on it he may have felt hope, but having begun to ink in his outline, he quickly abandoned the sketch. Perhaps he was distracted. Perhaps Keats lost patience holding the pose. Late in January there was no resistance." You all might be interested in a book entitled Portraits of Keats by Donald Parson (I think that's his last name). The entire book is devoted to discussions of nothing but portraits/busts, etc. of Keats. Some are, needless to say, very interesting! Again, I wish I had a scanner!! Last edited by Ennis on Thu Dec 22, 2011 2:27 am, edited 2 times in total. "Sitting up in the middle of the night around this time, desperately trying to keep awake, Severn hit on the idea of sketching his friend. (This is the one we're all familiar with: my note). It was the second drawing of Keats he had attempted in Rome. The first, which has never previously been reproduced, was done after Keats took to his bed. Even so, it shows a powerful figure and though the eyes are large and pleading, the mouth is still full. One hand lies open in a characteristic Baroque gesture of supplication. As Severn worked on it he may have felt hope, but having begun to ink in his outline, he quickly abandoned the sketch. Perhaps he was distracted. Perhaps Keats lost patience holding the pose. Late in January there was no rersistance." I am indeed interested in having a copy of this book too- sounds very interesting. Ennis wrote: You all might be interested in a book entitled Portraits of Keats by Donald Parson. Ooo another great book recommendation! I hadn't heard of Parson's book - I'll have to check it out. The guy even has a "Keatsian" surname, made me think of JK's tender letter answering his sister's religious questions which he signs "Your affectionate Parson, John". Since I can't scan that drawing of Keats, I suppose I could do my best at describing it (ha! )! Keats is lying on his left side on his bed, propped up on pillows (or so it appears), with his face in semi-profile, turned away from the artist (obviously). His hair is longish, parted in the middle, and spread upon his pillow. His right arm is bent at the elbow and the (right) hand is lies across his left wrist. His left hand is outstretched toward Severn with fingers spread and palm up. Keats's face and left hand are the only parts of the drawing done with any detail, especially the left hand. The one eye that is visible in the drawing has almost a glazed look to it -- in my opinion. I imagine the numbers refer to the number of volumes. Anyway, thought y'all would be interested. The Donald Parson book is probably out of print. I found it, I believe, on the Biblio.comUK site. Its publication date is in the 1950s. Thanks for the description Ennis- hope I see this drawing one day! I find it quite hard to look at. His beauty and suffering are expertly captured by Joseph Severn. I still stand by my view that Severn, of all the artists to draw/paint John, most accurately showed him as he was. One really gets a sense of him in Severn's portraits.I wonder why this drawing has never before been printed in any books about John Keats? I would love to know who Severn gave this drawing to, how long he kept it for, who did he show it to...did Fanny Brawne ever see it...? One hand lies open in a characteristic Baroque gesture of supplication. As Severn worked on it he may have felt hope, but having begun to ink in his outline, he quickly abandoned the sketch. Perhaps he was distracted. Perhaps Keats lost patience holding the pose. Late in January there was no resistance. I think Ms Brown is quite mistaken- this was no pose but a real moment. It is so evocative of This Living Hand that I am quite lost for words. Well done, MrsRsCat!! That's it!. Now, if you could just locate that second deleted scene from "Bright Star" (that I spoke [wrote] of in the "Bright Star" thread) I'll be eternally grateful!! I just saw these posts about the "missing" sketch by Severn. Thank you, Ennis and MrsRsCat! I'm really grateful to be able to see this. And thanks, also, Raphael for bringing up This Living Hand...very moving. You are all right; this is a difficult picture to look at. The drawing looks an awfully like the carved image of John on the plaque at his gravesite. I could be (and probably am wrong: where I am now, I don't have access to my Keats's books to verify).